What is our mission as readers?? It's been so long since anyone has discussed that . . .
Ah, at last. A question I can sink my teeth into. Is there a single mission for us as readers? I doubt it. The 5th Epochal Revelation, like the 4th, means different things to different readers. However, unlike the 4th, the Urantia Book is a UNIFORM revelation in terms of "objective" symbology. That is to say, it is a mediated, non-personal bestowal, the first true mass media revelation available to us ("us" meaning neurally competent, communicable social organism). I don't believe it's merely circumstantial that the 5th Epochal Revelation comes as it does at this time in our evolutionary history, just when we are capable of dialogue in a much more instantaneous and global fashion. The way in which the 5th Epochal Revelation is becoming manifest is very powerful. The manifestations are being triggered and are coming to life FROM WITHIN each of us. We can argue and debate over commas and periods, meanwhile the sea of spirit is washing us down, more than we're consciously aware. Take me to the river. So, do you, Mary, identify yourself as a Urantia Book reader, or is that fact merely ancillary to you as a participant in the 5th Epochal Revelation? To my way of thinking, anyone who truly "reads" the Urantia Book with an open hunger for truth and search for righteousness, will go through various mental, psychological and spiritual transformations. These transformations will make such concerns about commas and periods as the bickering of children over who got the bigger piece of candy - sometimes cute, sometimes pathetic, but perhaps always necessary for transformation from reader to faith child. I honestly don't know what my mission as a "reader" is at this point. Socially, I will obey the law. I will render legally unto the Urantia Book what is due the Urantia Book. Culturally, I will gravitate toward those persons of fellowship who appear open, sincere and spiritually fragrant. Spiritually, I will try to follow the lead of my personal spiritual guides in transmuting from animal to mortal to morontial to spiritual. For me, the minute to minute communion is becoming paramount. The details of my life, like the commas and periods of the Urantia Book, are just shadows of hairs. I am the turner. I am the personality who chooses to choose. Where is God typing on this keyboard? Where is God responding to Mary's post? Where is God answering my son's question as to the whereabouts of the mayonnaise for the hamburger he just cooked for himself? Obviously it looks like we three are going to have to take this revelation to a new level. Follow us we really know the way. Not like those other guys. If as mysteriously the Urantia Book appeared to man this century, and in the year 2000 the book just as mysteriously was taken from this planet without a trace, could all the individuals who have experienced the brief revelation be able to carry it on? In other words, is the message larger and more powerful than the book itself? Would you or anyone else go back to just a regular hungry person searching for a new truth or did what you learn in your brief relationship with the book create a new foundation for a better soul? I can never not know what I know now. I can never go back to not knowing. The reason I ask this is to me this was my revelationary growth. At some point during my digesting and comprehending the truths within this magnificent book, like the sneaky thought adjusters popping into one's head, I rounded the last corner of doubt. I could not go back. It felt like isolation at times. As a whole movement, we are engrossed with mixed doubts more than faith. Doesn't matter if some of our UB family members are caught in this mindless, unproductive tug-of-war with our Fifth Epochal Revelation, I am here to state my faith that one day the movement will round that last corner of doubt and we will never not know. We will never question who's doing what, or who's doing more, or who knows more. For those of you that can relate to this isolation feeling, confused feeling and purpose to the whole, welcome, you're not alone. If I had it my way, I would put all the Urantia readers on one big island and have campfires and listen to Richard Keeler play the banjo. But, I can't because I have to go to work now. So until I come up with a better plan I'll just keep living a normal life. your comments were lucid and insightful, and reflect similar feelings I have had, rather strong in years past, of knowing I cannot go back (nor would go back), and yes, I've also had moments of loneliness and a sense of isolation regarding the revelation. thanks for the commentary. I can't quite put my finger on it, but I'm disappointed the direction the ub lists seem to go. it's not that I'm clamoring for the lists to go my way - it's more what's missing, the scarcity of spiritual subject matter and content, in general, that is disappointing to me. I'm not a negative person, and I'm struggling with the purpose and value of participation (on-line) right now. Our mission is of course, to Do the Will of the Father. What is the Father's Will? I hope there are a number of answers posted. My mission as a UB reader is to live the teaching to the best of my ability, to love my siblings unconditionally, and to serve them as Jesus would. In case there is any question, my siblings are everyone on the planet. amen brother and we're headed in the right direction too, I might add. The Father's will is obviously that human free will be allowed to run its course, even at the expense of default. Otherwise, the revelators would probably have hung around here and personally guided this revelation until it accomplished its intended goals. HE must really have faith in us.
. . . to became the 6th revelation. I do not believe that this is possible for me to become the 6th revelation. I still have trouble serving as Jesus would. I think my mission has a lot to do with being the best husband, father, worker, and community member of which I am capable. The book says that while the work of the worlds to come is very important, paramount is the work of this world. "One life at a time," as Thoreau said on his deathbed. I'm a third-generation reader of the book. That doesn't mean I'm any more spiritually fragrant than anyone else; it's just a fact that affects my approach to it. I'm not particularly on fire to save the world for The URANTIA Book in our generation. I've had a very poor track record (apparently anyway) of introducing the book to others over the past 35 years. I love the book and study it seriously, but the real work is out there trying to do God's will in a mixed-up world. Even Jesus had to make a living and support a family. I feel sorry for some of the angry people on this list. The mission isn't to spiritually mug people with our book, it's to live a life of service. If someone gave every man, woman, and child in the United States a URANTIA Book tomorrow, would it change anything, or would it be overwhelmingly rejected by a secular and cynical culture? Our mission is to live loyally as tadpoles. I am filled with the spirit (or something :)). I see a great misunderstanding regarding what the Foundation IS. Larry Watkins says there is something insidious about the fact a pamphlet was not produced and updated about changes in the UB. As a volunteer at 533 I have seen things first hand that I would like to share with all of you. There are only 8 persons who work at 533, and two of them have dedicated this past year to helping out but plan to leave at the end of the year. Until Tonia came and hired an assistant there were just 4 people there. It has simply not been possible to produce booklets addressing changes before they were actually asked for. They try their best to keep up, but this handful of workers simply cannot anticipate needs of the readership. There is no secret, as Jeff Keys so ably pointed out. They are simply busy keeping up with book orders, publishing needs, readers who call with questions trying to figure out just who the people are behind this incredible book they have come across in the book store. finally delivering it to the Post Office. They do this with equipment that not meant to handle this sort of job. It takes days just to get one item out, and I'm not even taking into consideration the formatting and printing. This is a considerable bite out of everyone's work day. This Foundation is no huge, heartless machine. It limps along in a building that needs repair, in small spaces with folks that take the brunt of the anger and hate of others on a daily basis. It hurts me to see and hear folks tell them they shouldn't be posting their personal thoughts on this list. There is no great conspiracy to keep things secret, just an inability to keep up with the incredible growth they are experiencing. Now usually growth means more money, but they make very little on the printing of the book. Much of the profit is funneled back into a printing fund to make sure the books keep getting printed no matter how fortunes may ebb and flow. If we have a mission as readers regarding the Foundation, it would be to facilitate the work that needs to be done. This is not a religion, this is a loosely knit group of dedicated believers who can actually make a difference by sending money or volunteering to fill a need. Yeah, we lack a charismatic leader, thank God. There is no big plan, so far, but they are working toward it with an eye to the future and a dedication to the Father that does not translate into forming churches or creeds. This is the part where you all come in. If you are someone without a personal agenda who can take a positive part in facilitating these efforts, who is willing to work with others in an effort to discern the Father's will, you are needed. Come with a humble heart and new eyes and you will be a part of this effort. Even if you are a follower of the Fellowship, I know we can find something that will not cause you to compromise your values, there is so much to be done. I am the least of my brothers, and I serve the Father. being a backpacker and a lover of trails this rings especially true. what we need are more folks to step forward with ideas on how to find common ground; service trails that unite folks toward achieving common goals. wouldn't it be wonderful if UBROS was instrumental in bringing folks together from both sides of the schism to work the many service trails? But true religion is a living love, a life of service. 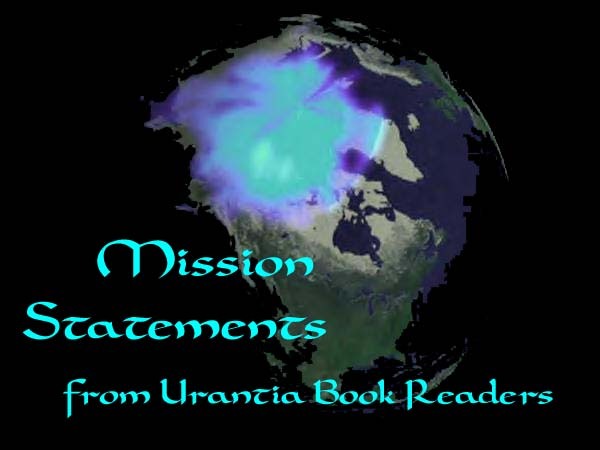 how will the world of tomorrow feel about the Urantia Book?